The title of the next Call of Duty game may have finally been revealed, and it doesn’t allude to the blast to the past many CoD fans have been eagerly waiting for. After a PlayStation 4 owner seems to have caught what looks like an accident of a listing when browsing the “Trending” section of the PlayStation Store, many gamers and CoD fans have begun speculating what the next game will offer. It’s no secret that long-time Call of Duty fans have begun to grow sick of the futuristic warfare the last few games in the series have been based on. Many have been vocal about wanting a sequel to Treyarch’s 2008 release of Call of Duty: World at War, but assuming Activision’s 3 studio cycle continues, we won’t be seeing another Treyarch release until 2018. It’s quite the wait, and more than enough time for Treyarch to consider appealing to their older fans. As for this year’s Call of Duty, if you haven’t found out yet, it’s being developed by Infinity Ward, the developers responsible for the Call of Duty: Modern Warfare series, along with Call of Duty: Ghosts. 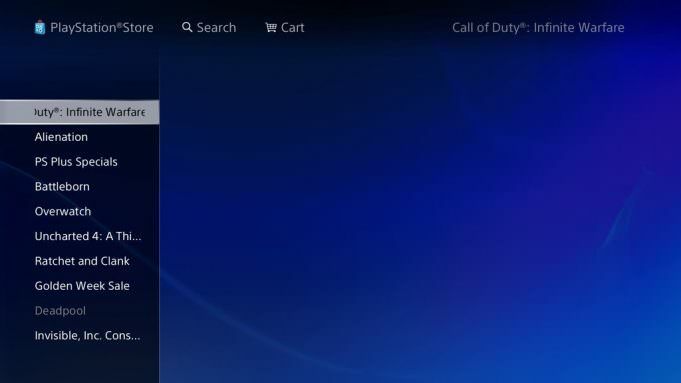 Now according to the Trending page on the Playstation Store, this year’s CoD will be titled Call of Duty: Infinite Warfare, a pretty bland title once you think about Modern and Advanced Warfare. The word “Infinite” certainly doesn’t seem to favor a game based more realistic warfare. As the past few Call of Duty games seem to have progressively advanced with the game’s in-game technology, it was semi-realistic, and most of the weapons and tools used in the games could quite possibly be how warfare will be fared in the future. Call of Duty: Black Ops III was a bit of a stretch, but with the way tech is advancing, nothing can be overlooked as impossible. While it’s unknown how far into the future (or past) Infinity Ward will take this game, we can expect to see an official announcement on the game within the upcoming weeks, due to this being around the time when Infinity Ward reveals details on their upcoming CoD titles. In the comments below, let us know what time period you think Call of Duty: Infinite Warfare will fall in. Do you think they’ll make a game based on modern warfare? Or will they take it even further into the future by making a Crysis-esque based game? Aquatic Mods, JuggaloMods, lol and 5 others like this.